Previous Page - and South Africa v England ODIs review and images. and the chance to tick one more item from my 'bucket list'. I have watched many a game at Newlands, but only on the TV. There are many fine grounds around the world but from the comfort of my sofa none has looked more tempting than Newlands and its fine view of Table Mountain. Already accomplished in the world's greatest views are sunrise over the Himalayas from Darjeeling, the Golden Gate Bridge and, one that should be on everyone's list, every angle you can find of the Grand Canyon. It might seem strange to put a cricket ground in this context but with a life-long passion for this sport - and 'passion' IS an appropriate word in my case - and the last twenty plus years (23 to be more precise) following the women's game in particular, it seems to me entirely appropriate. I have linked above to an article on the world's most attractive grounds. Were I to write about my favourites you would expect to see a different list, and you'd not be disappointed. I really must get round to it one wet, windy and cold winter's day, but to kick my ideas off I'd have to include Lord's and Preston Nomad's Ground at Fulking in Sussex. One of the amazing things about cricket is that there's so much to admire in the world's great stadiums and in the small country grounds too. And I'd have to include North Sydney Oval with its iconic green stands so evocative of another era, and then there's... I think this had best wait for another day as an aeroplane to the Cape awaits. England fans around the ground may have been a little amused as the England openers came out to bat and the public address system described them as Tammy Edwards and Charlotte Beaumont. However at 41-3 things didn't give much indication of a lot to smile about. True the run rate at over 6 was acceptable for the number of overs bowled but wickets were falling a little too easily. Taylor however carried on regardless. Playing a full range of shots including several 'Dilshan's' she soldiered on showing much of the flair associated with her batting. England, however, seemed to lose wickets in pairs - never a great idea - and the final total of 147 I described to a couple of England fans more used to watching the guys play, as "par, no better, no worse". Taylor, of course, had made more than half of these. Chetty and van Niekerk batted well enough and, had they been setting a target rather than chasing one, I would have felt they had done a fair job. However, while at times their score was close to comparable with England's at the same point, it became obvious that unless Lee could do something special, the chase was getting more and more difficult for those that were to follow. And indeed it proved too much when Nierkerk and Chetty departed and the match fizzled rather in the headlights of some fine fielding by England, holding those desperately needed runs at bay. If there has been a feature of the ODI and now the T20 series that really stands out is has been the fielding and the catching of both sides. The overall standard of both teams has been so high (in England's case in patches it's true), and from watching South Africa in the past I would say, if they have a new fielding coach, CricketSouthAfrica would be well advised to double his salary. He has done a fine job. Virtually all blogs on the 'Net are therapy for those who write them and this one is no different to any other in that respect. It is a mixture of reporting as seen through my eyes and, occasionally, the chance to share my views on this sport with a wider audience than I might meet on a boundary rope during our short British summer. It also gives me a chance to speak occasionally on more wider ambitions, and one of those was to watch a game of cricket at one of the world's most iconic grounds. The fact that it was a women's international was, for me, an added bonus. It was, as they say, one ticked off the bucket list! Georgia Elwiss captures the mood of Newlands during the subsequent men's game. One thing that was somewhat unexpected was the way in which the mountain dominates the ground. If, like me, you had not been there, you would imagine that the mountain appears some way off. Now I have no idea of the distance in yards, miles or even kilometres, but the mountain appears close and almost sitting astride one boundary. Wide angle views as you tend to get on TV and in Georgia's excellent shot above (and indeed in my only moderate wide-angle view below) do not capture the mood of the place on a dull and sometimes drizzly day. That's not to criticise either images - it is in the nature of wide-angle lenses and we tend to forget the change in perception they give rise to. Can you capture the feel of a place like this? I'm not sure and it would certainly take a better photographer than me! I have experienced the same elsewhere in the world where I have yet to see a single photo that really captured the Grand Canyon, fine as many of the images are. Some places somehow defy the ability of the technology to place three dimensions into two and retain the authenticity of the place. You will have gathered I believe it is an experience every cricket watcher, and player, should aspire to - a game at Newlands! But it would seem it was not just me who had an ambition fulfilled that day. It must have been a heady experience for eleven girls in green too, for, after many attempts, they beat England in a T20 match. If you check the scorecard, don't be fooled by the D/L result. There was no doubt in my mind that, barring a miracle, it was South Africa's match had it run its full course, and by definition, miracles happen only rarely. They needed a mere 12 runs in 16 balls, a rate far slower than they had already achieved. Table Mountain Hides itself Under the "Table Cloth"
The Fine Gardens at Kirstenbosch, one the world's greatest. ... to name but two from many, was just too much to resist. I have already mentioned my thoughts on being a spectator at Newlands, but I was able to fulfil one other ambition and promise while there that gave me great satisfaction. 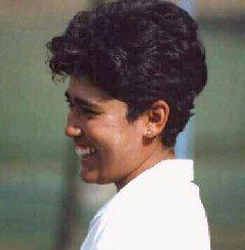 Back in 1997, in a match during which the current England captain made her first ODI century, I watched a remarkable performance by a young lady representing England's opponents on that day, South Africa. She had batted for her country just twice, both times at number 11, and had made, perhaps not surprisingly in view of that position in the order, two single figure scores. It took one of the most inspired and bold decisions any captain (Kim Price in this instant) ever made to decide to open with her. She made a half century at appreciably faster than a run-a-ball and got her side off to the start it needed to chase down England's 253, one of the highest ODI scores made at that date. That her team ultimately triumphed was in no small measure down to her contribution. With regular opener Linda Olivier, who I was lucky enough to meet in South Africa, they added 105 for the first wicket. South Africa have improved markedly every time I've seen them, series to series, and taking two matches off England, one in each of the short formats of the game, should really be no surprise to anyone. England may be disappointed but I cannot say that I am for two completely different reasons. Firstly women's cricket desperately needs sides to challenge the top two. With recent results by New Zealand, India and the West Indies it is becoming apparent that no side can rely any longer on a match being a 'one-way street'. That can only be good for the sport as a whole. Secondly, England needed something to push them before the WT20. Six simple games would have done them no favours at all as the coach expressly mentioned in an interview. Taking two matches from England must give the players something to think about - at the WT20 every game may well count! England's fielding was well below par for the majority of the time although I did hint in one match notes that there were periods when they looked like their old selves. Sadly these periods were few and far between as the management again acknowledged. While a number of suggestions have been proffered for why this should be so, I cannot pretend to know the answer. One poor match and I would have shrugged and said 'everyone, and every team, has one now and again'. However this was rather too long a run to write it off quite so easily, and the purple patches did show they are perfectly capable of being among the best in the world. England have sorted out an opener in Amy Jones. I know there are other contenders but you only, I contend, take the job away from someone after they shown they have problems doing it and Amy certainly has not done that! Tammy Beaumont looked much more comfortable in the middle order and if there's a place for her with England I feel that's where she should be. Spinners have, in general, been more successful in the women's game than in that other game (men's) in recent times. I wonder from this series if they will find life quite so easy in future as batsmen from both sides looked to take them on more forcefully than of late. South Africa might consider themselves the best catching side in the world and you'd have a job to argue very differently after some spectacular performances. If the hosts lack anything it would seem to be depth, ad possibly a fifth bowler. While many sides, England especially, bat a long way (if not all the way) down, South Africa's lower order did put up a fight in some games but found it hard in others. As 'the other game' found a while back, lower order players do need to make a contribution with the bat and the sides that can will win more often. It's great to have players of the quality of van Niekerk and Kapp but they cannot succeed every time (rather obviously) and even when they do, the difference in the final scores will often come down to how many runs numbers 7 to 10 make. England need Elwiss for her batting! Once thought of as a bowler who bats, there's no doubt now she's a batsman who bowls - and bowls well enough to be either the 4th bowler or make up the 5th bowler's ration with another team member. I used to say that when choosing an England team I would write down around six names and then chew my pencil, not necessarily because there wasn't anyone I thought worth picking, but who should I pick from in the remaining choices. Today Elwiss would have to be in the six! And talking of sixes (which I wasn't) I am getting rather frustrated at the continuous mention of them in TV commentary. They play little part in the women's game, and I'm happy if it stays that way. Yes, they can be exciting to watch but I'd be interested to know if anyone has tried to analyse how many runs they've contributed compared with how many downfalls they have resulted in when batsmen, who could have settled for a four along the ground, have attempted to hit one. My suspicion is they are completely counter productive... In fact there were times I've thought the same about the men until these monster bats came along. The boundaries were way too short and almost insulting to the players. If there is no chance of manoeuvring a 3 - or even a 2 - then much of the art of the sport is lost. They were shorter in the T20s (or so it seemed to me) and it looked as if the powers that be were saying - "well, women can't hit a ball really". You'll hear more of Laura Wolvaardt in the future! All round it was an interesting couple of series and one not so easy to win as some England supporters might have thought before the off. I will be watching the performances of both sides carefully in the WT20. How will South Africa fare against the other 'big names'? It'll be intriguing to find out. Do I Deserve a Cap? Following Sarah Taylor's cap for playing 100 ODIs for England it set me wondering how many I had watched. Because of the excellent stats on this site provided by Marion Collin it was a simple matter to scan through. The answer turned out to be 116, with almost, yes almost, all involving England, although one or two at World Cups and the like were between what is to me neutral countries. There would only be a handful of those to in which I have not carried a camera, starting in the days of film when life was much tougher than today and the excellent shot that much more difficult. The first, and minus camera, was the semi-final of the World Cup in 1993 at Guildford, when England beat the old enemy and progressed to the final against New Zealand at Lord's. When I have a moment I will check my T20 record where a slightly larger proportion will be between 'neutral' sides. Why? Because of the very sensible idea of playing matches on different days i.e. not one day where matches are played all over the place, but day after day it was possible to watch all sides play each other rather than just follow England. I have to hope the organisers of the 50-over World Cup come to realise adopting the same plan would increase the gates, the interest, and who knows, maybe even the TV coverage. Hasn't happened so far as far as I recall but can England in 2017 break the mould and show the imagination that this great tournament deserves? I seem to be forever typing 'we must wait and see'. Next Page - "And Now the Exciting Bit..."